Posted by Mark Walas on May 13, 2014 in Featured, Learning to Trade? Financial freedom, or financial independence, is generally defined as a person having enough funds to be able to live their life the way they desire without being burdened by financial worry. In this day and age, I believe that financial freedom is more of a mindset – it is about more than having disposable money and it is about more than being rich. Financial freedom is a state of mind that allows us to be carefree and to do the things that we desire and act in a way that truly represents who we are. Everyone seems to be striving to become rich and to score a job with a six-figure salary but I believe a significant part of being financially independent is about learning to not live beyond your means. It is essential to be able to budget for your income and to be relatively ruthless in terms of what you can realistically afford. As well as managing money I believe that financial freedom is also directly linked to our time and how we use our free time. If we start to utilise our free time and spend time doing the things that will make us happy I believe we will be moving towards a state of mind that is closer to financial freedom. Maybe financial freedom is not possible just yet for some of us but we always have the choice in how to budget for our everyday lives and we have the choice of how we spend our time. We should be optimising these aspects of our lives to ensure that we are making the most of our time and our finances. 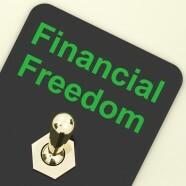 What does financial freedom mean to you and how do you plan to achieve it? It would be great to hear your feedback so please leave us a comment or get in touch via Twitter.